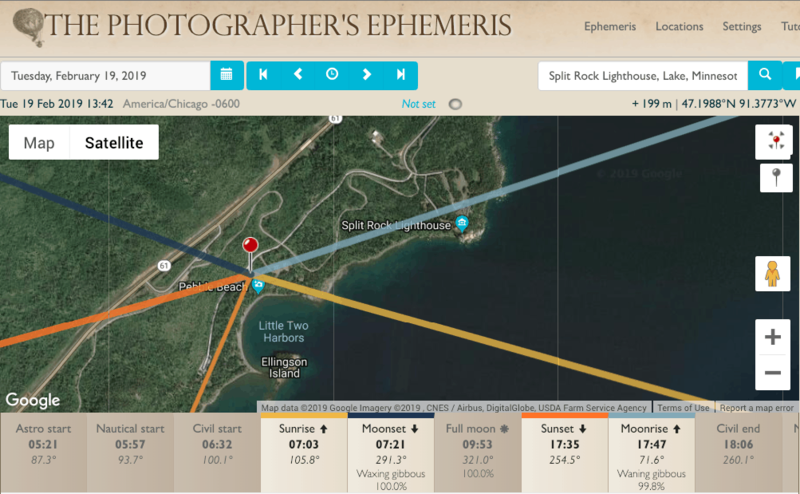 Web and phone apps like TPE and PhotoPills make planning your night sky shots a snap. 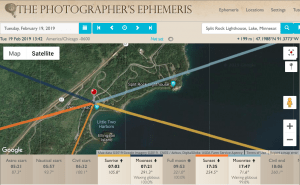 Using tools like The Photographer’s Ephemeris or PhotoPills makes planning your night sky photography a cinch. No star charts and sextants necessary. With them, you can pick a location and date then see the optimal time to take your picture. Try the wayside rest just south of the park entrance for iconic shots like the featured image in this post. Another nice spot is just north of Pebble Beach. It’s a gentle hike but gets icy in the winter, so be careful! The Gitchi Gammi Park on the north end of the Duluth hosts Brighton Beach – a lovely spot for enjoying an evening photographing the night sky. Be warned, though, this close to Duluth you’ll be dealing with more light pollution than some of the more remote spots on the shore. Stoney Point is just south of Larsmont Cottages, and it’s a popular spot for photographers, surfers, and…well anyone that loves Lake Superior. You don’t need to buy a fancy, expensive lens just for your north shore vacation. There is a multitude of affordable rental options that are perfect for trying out a new style or gear while traveling. Featured photo by Dennis O’Hara is used with permission. Your Moon Photo Could Win You a Vacation!